Psychologists, psychiatrists, psychoanalysts and psychotherapists have been attempting for decades to understand how the mind works. Is it just a bundle of nerves? Where is it? How do thoughts and other stimuli travel from one part of the brain to another and out into the body? How do stimuli from outside the organism pass through the senses to the brain, spinal cord and other parts of the body? Mapping the journeys has been an enigmatic puzzle, as have the effects on the mind of drugs, disease and stress. The London Science Museum in South Kensington is currently showing a small exhibition about the history of brain and nerve exploration, explaining who and what was used to map the activities of the nervous system over the last three centuries. Since its discovery, electricity was believed to be the force behind all bodily and neural activity. The exhibition describes how scientist and politician Benjamin Franklin (1706-1790), evangelist the Reverend John Wesley (1703-1791) and many others tried to prove that electricity is the main source of energy in all nervous systems, human or otherwise. Experiments with small shocks led to a belief that electricity could alleviate symptoms of ‘nervous afflictions, paralysis, melancholy and low spirits’ (Science Museum London, Ground floor exhibit). This theory has never been disputed, and even today electrotherapy is still used for severe mental illnesses. Luigi Galvani (1737-1798) thought that the energy behind all bodily functions involving movement of muscles, voluntary and involuntary, is due to electrical signals and he showed this by passing a current through the leg of a dead frog. The frog’s leg twitched, seemingly bringing it to life. Demonstrations like these were also put on at the Royal Institution, London, to a crowd of onlookers and were regarded not only as scientific evidence, but also as a form of entertainment. 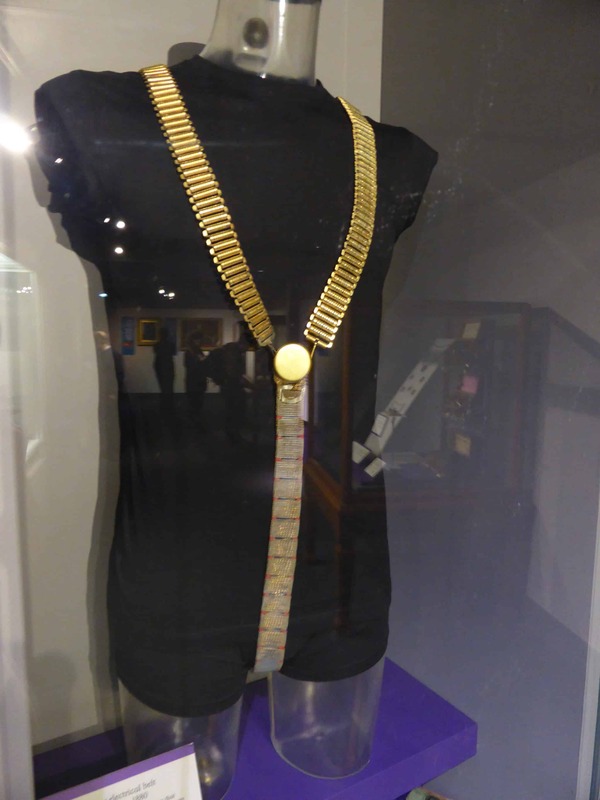 Many of the machines used in electrotherapy are displayed in the exhibition in glass cabinets, one of these being the Galvanometer. This was used to detect the speed of a nerve impulse. Other primitive machines were also used to provide the small shots of electricity to a sufferer, labelling this procedure ‘electrotherapy’, for example the ‘pulvermacher’, a metal belt which when worn after bring soaked in vinegar gave off a small electric current. I can only imagine an outcome of some discomfort matched with the odour of fish and chips. According to the blurbs in the exhibition, even Freud (1856-1939) and Jean-Martin Charcot (1825-1893) used electrotherapy for hysteria and convulsions before developing ‘the talking cure’, psychoanalysis. Charles Sherrington (1857-1952) named the connections between nerves as ‘synapses’. Then Henry Dale (1875 – 1968) in experiments on animals and with chemicals like adrenalin concluded that neurotransmitters filled the gaps between nerve endings, creating strings of neural messages. Other displays showed the first EEG (electroencephalography) machine. It was used in Bristol, UK, by neurophysiologist William Grey Walter (1910-1977); brain activity was recorded by gluing wires to a patient’s scalp. Psychiatrist William Sargant (1907-1988) first used the machine at the Maudsley Hospital in London on traumatised WWII soldiers in an attempt to explore what was happening in their brains after trauma. War years are often times of great scientific innovation and, after WWII, new wartime machinery was adapted to be able to detect brain waves more effectively. At the same time drugs to address depression were being tested. 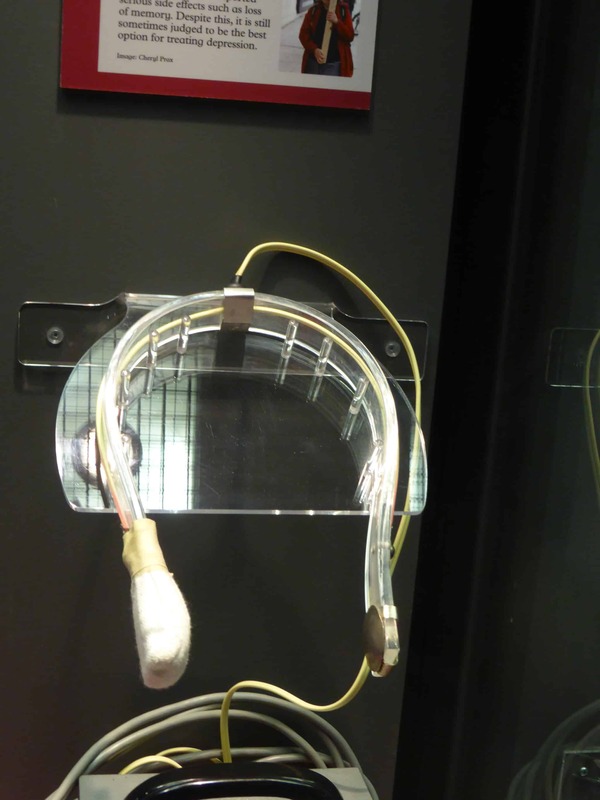 The display case showing a head-band that was used for ECT (electroconvulsive therapy), a practice which superseded lobotomies, brought goose bumps to my skin. ECT can bring about calm in suffering patients, although it is not known exactly how. Many of the machines shown in the exhibition became obsolete once it was realised that chemical imbalances could cause mental instability. Several anti-depressants and mood enhancers have been developed in tablet form since, two famous ones being Valium in 1963 and Prozac in 1987, the latter affecting the release of serotonin. Nevertheless, nerve impulse trackers were still regarded as essential in neurotransmission research. In the 1980s, IQ was being tested by Hans Eysenck (1916-1997) and was believed to be connected to the reaction times of electric currents along nerve fibres. The exhibition displayed an example of a sensor net that replaced the glued on electrodes of the past. These are used in research, for tracking brain waves (for example during sleep) and for exploring language and perception. More recently, TMS (transcranial magnetic stimulation) has been developed to detect neural activity and this is commonly used by neuroscientists and psychologists today to study brain functions and interconnections. The display raised many questions posed by neurologists, one of these being, ‘can tracking nerve impulses help us to understand conditions such as dementia and brain damage?’ Twentieth century PET (positron emission tomography) scanners are now able to track nerve activity and have been used for the past 30 years. By using radioactive tracers, the scanners can find ‘hot spots’ where brain activity occurs. In the past, she had been involved in psycho- and chemical therapy and yet the voices were still very potent. 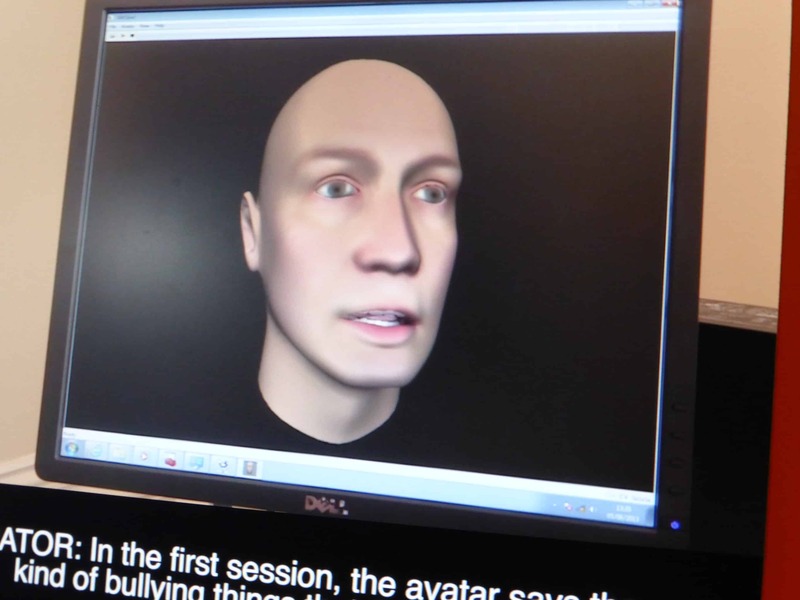 The use of avatars was adopted by Prof Julian Leff (http://pb.rcpsych.org/content/28/3/112). Claire and the therapist sit in different rooms. Each has a computer. The therapist has control over the voice of the avatar. The avatar repeats statements to Claire that she has reported to the therapist previously. The therapist encourages her to reject the avatar’s statements and tell it to go away. Over a few sessions, the avatar becomes less hostile, and Claire learned to control it. As a consequence, she was eventually found to be much less affected by her voices. To me this resembled the practice of ‘empty chair’, but Leff reports that this was used only in severe cases such as with schizophrenics. Finally, the exhibition reports briefly about a current research study of 1200 participants mapping billions of nerve pathways between cells and brain tissue, in the hope of finding the sources of depression, dementia, loss of brain functions due to stroke and brain damage. While for me the publicity for this exhibition looked impressive, with the exception of the avatar therapy display, it far outweighed the content. Lynda Woodroffe is an integrative psychotherapist working in NW London and a member of the Contemporary Psychotherapy editorial board.